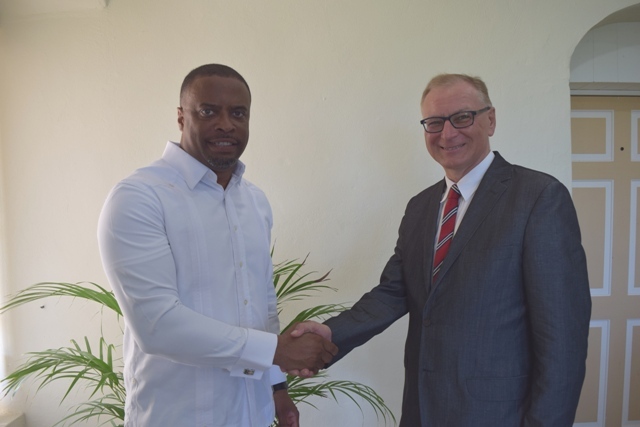 NIA CHARLESTOWN NEVIS (July 14, 2016) — Poland’s Ambassador to St. Kitts and Nevis His Excellency Piotr Kaszuba, paid a courtesy call on Foreign Affairs Minister in St. Kitts and Nevis Hon. Mark Brantley, at his Nevis Island Administration (NIA) office at Bath Hotel on July 13, 2016. In brief remarks ahead of their close-door discussions, Mr. Brantley told the Department of Information that he was pleased for the ambassador’s visit. He said Poland is enjoying good relations with the Caribbean since becoming a member of the European Union. Mr. Brantley said he looks forward to working with the ambassador. Meantime, Ambassador Kaszuba said it was his first visit to Nevis and he admires the island’s beauty which reminds him of paradise. He gave a brief insight into the reason for his visit and discussion with Mr. Brantley, regarding his country’s proposals for group representation of small islands into the United Nations Security Council. “I came here to make our relation closer and one of the purposes is to talk about the appointment of the Honorary Consul of Poland in your country and secondly, as a candidature of Poland, as a non-government member of the Security Council, one of our aims during our term, if we are elected, will be the support for cross regional representation in the Security Council. “As we know, small countries do not have many opportunities to be elected and it is a good idea to have group representation of small countries into Security Council. So I would like to talk to you today to tell you about our proposals,” he said. The Poland Ambassador visited the Bath Stream following the meeting before he left Nevis for St. Kitts.